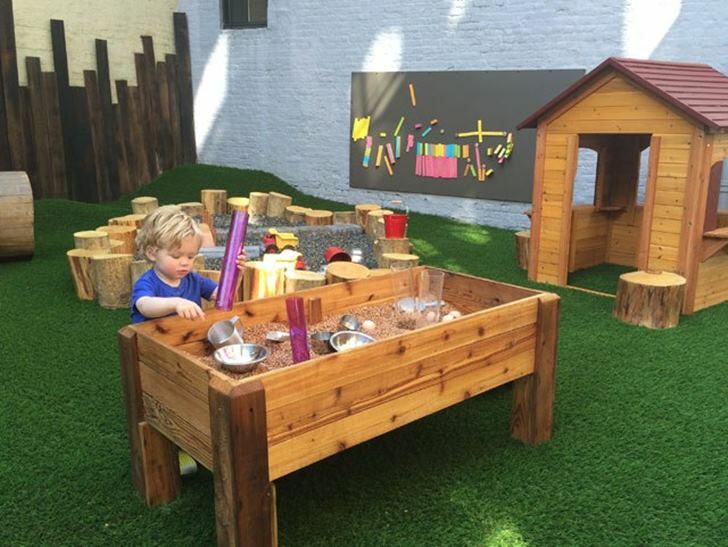 Brooklyn-based boutique toy shop Norman & Jules just debuted their new eco-friendly backyard play space. Norman & Jules owners Avi Kravitz and Courtney Eber, have created a wonderful outdoor play area for kids, complete with artificial turf, a hill kids can roll down, a sensory play table filled with cork bits, cups and scoops, an inviting play house, a pebble-filled sandbox, a table of blocks to stack, a magnetic wall outfitted with Tegu blocks and much more. From June to November, this outdoor play area will be open for drop-in playtimes Monday-Wednesday, from 10 am-12 pm, Monday-Friday, from 1:15 pm–3:15 pm, and Saturday & Sunday, from 9:30 am-11:30 am. There’s a small fee of $12 for your first child and $6 for siblings. There’s also a slew of fun activities planned in this space, such as storytime and playtime on Thursdays and Fridays, 11:15 am-12:15 pm, sing-alongs and Tot Yoga. You can see all play space events here. If all of this sounds like fun for your kids, and you’re in or near Brooklyn, head over to Norman & Jules at 158 7th Ave., Park Slope. Brooklyn-based boutique toy shop Norman & Jules just debuted their new eco-friendly backyard play space. Norman & Jules owners�Avi Kravitz and Courtney Eber, have created a wonderful outdoor play area for kids, complete with artificial turf, a hill kids can roll down, a sensory play table filled with cork bits, cups and scoops, an inviting play house, a pebble-filled sandbox, a table of blocks to stack, a magnetic wall outfitted with Tegu blocks and much more. From June to November, this outdoor play area will be open for drop-in playtimes Monday-Wednesday, from 10 am-12 pm, Monday-Friday, from 1:15 pm--3:15 pm, and Saturday & Sunday, from 9:30 am-11:30 am. There's a small fee of $12 for your first child and $6 for siblings. There's also a slew of fun activities planned in this space, such as storytime and playtime on Thursdays and Fridays, 11:15 am-12:15 pm, sing-alongs and Tot Yoga. You can see all play space events here. If all of this sounds like fun for your kids, and you're in or near Brooklyn, head over to Norman & Jules at 158 7th Ave., Park Slope.